A bouquet, boutonnière or hair accessory - use some greenery to adorn yourself. Use an abundance of greenery to frame you and your beloved as you exchange vows in front of your nearest and dearest. It's incredibly easy to source and is a beautiful representation of life and vitality. Below: Image 1: Photographer - Just For Love Photography, Stylist - Inspired by Love Events / Image 2: Photographer - Day One Wedding Photography, Floristry - Oak & Linden / Image 3: Stylist - The Style Co.
Below: Image 1: Stylist - IGBY Productions, Stefani Driscoll Photography, Flowers - Moss Industry Weddings & Events / Image 2: Photographer - Just For Love Photography, Stylist - Inspired by Love Events / Image 3: Photographer - Day One Wedding Photography, Floristry - Oak & Linden / Image 4: Stylist - The Style Co.
Below: Image 1 - 4: Stylist - The Style Co.
A unique and simple way to dress up your reception tables. Create overflowing foliage, interspersed with fresh blooms and herbs for a delight to the senses. Below: Image 1: Stylist - IGBY Productions, Photography - Stefani Driscoll Photography, Flowers - Moss Industry Weddings & Events, Stationery - Natalie Sitka / Image 2-3: Photographer - Just For Love Photography, Stylist - Inspired by Love Events / Image 4-5: Stylist - Main Event Weddings, Photography - Heart and Colour / Image 6: Pollen & Patina. Why not use a touch of garnish to dress up signature cocktails and decorate your wedding cake. Many delicious herbs such as rosemary, thyme and mint make for beautiful and simple drink accompaniments. Foliage is even making its way into stationery designs. 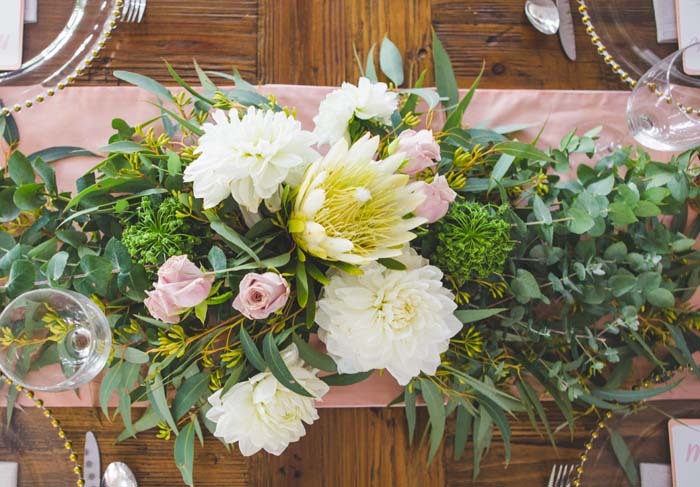 Extend an invitation to your guests or communicate the evening menu with beautiful watercolour native Australian foliage or lush green fern illustrations. For more inspiration for how to use foliage to style your wedding, check out our Modern Wedding Styling Handbook or Flowers Magazines.